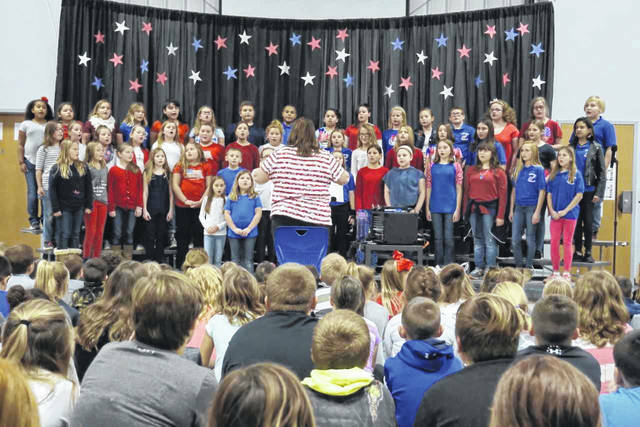 The New Haven Elementary Chorus, under the direction of Kimberly Bond, performed a Veterans Day concert for students, veterans and the public Thursday afternoon. “American Heart” was the theme of the program, with several children also giving readings. Members of the Smith-Capehart American Legion Post 140 of New Haven and Stewart-Johnson V.F.W. 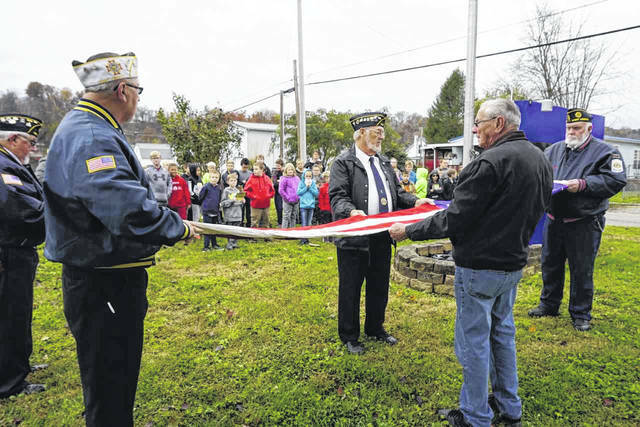 Post 9926 of Mason are pictured as they show fourth grade students at New Haven Elementary School the proper way to fold a flag. The veterans also demonstrated how to raise the American Flag, and told them why the flag sometimes flies at half staff. MASON — Even on a day when they were to be honored, members of the Smith-Capehart American Legion Post 140 of New Haven and Stewart-Johnson V.F.W. Post 9926 of Mason unselfishly gave of themselves, once again. The New Haven Elementary School Chorus held its annual Veterans Day tribute, “American Heart,” for local military members on Thursday. But prior to the concert, Legion and V.F.W. members taught the fourth grade students how to properly raise the American Flag, how to fold it, and why it sometimes flies at half staff. The fourth graders were given several handouts as they watched and learned at the flag pole. Later inside, the chorus under the direction of Kimberly Bond, presented a program for the many veterans, as well as students and members of the public who attended. The chorus sang five songs, including the National Anthem, “American Heart,” “Arlington,” “America the Beautiful,” and “This Flag We Fly,” during which sixth grader Johnathon Roush served as soloist. Principal Walter Raynes recognized each veteran in the audience, as well as the branch of service in which the veteran served. He also told the elementary students to be sure and thank any veteran in their family or any that they might meet during this Veterans Day weekend. A number of students read essays that they had written while studying the branches of the military. They included Jayla Simpkins, Army; Eli Rickard, Air Force; Payton Barnitz, Navy; Grant Roush, Marines; Ryleigh Fink, National Guard; and Kate Reynolds, Coast Guard. Halo Young, Nicole Barnette, Shy Denney, Ella Edwards, Courtney Hacker, Anna Bella Mankin, Samantha Miller, Katherine Reynolds, Johnathon Roush, Aaron Spurlock, Macie Whittington, Zaylee Wood, and Makayla Woolard. https://www.mydailysentinel.com/wp-content/uploads/sites/14/2018/11/web1_11.9-NH-1.jpgThe New Haven Elementary Chorus, under the direction of Kimberly Bond, performed a Veterans Day concert for students, veterans and the public Thursday afternoon. “American Heart” was the theme of the program, with several children also giving readings. https://www.mydailysentinel.com/wp-content/uploads/sites/14/2018/11/web1_11.9-NH-2.jpgMembers of the Smith-Capehart American Legion Post 140 of New Haven and Stewart-Johnson V.F.W. Post 9926 of Mason are pictured as they show fourth grade students at New Haven Elementary School the proper way to fold a flag. The veterans also demonstrated how to raise the American Flag, and told them why the flag sometimes flies at half staff.